Hip Baby Blog: Justice Rocks! 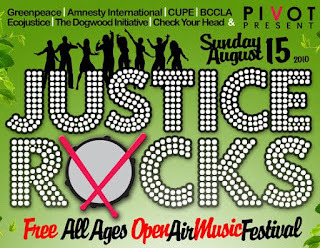 Pivot presents Justice Rocks! A free event in Strathcona Park. 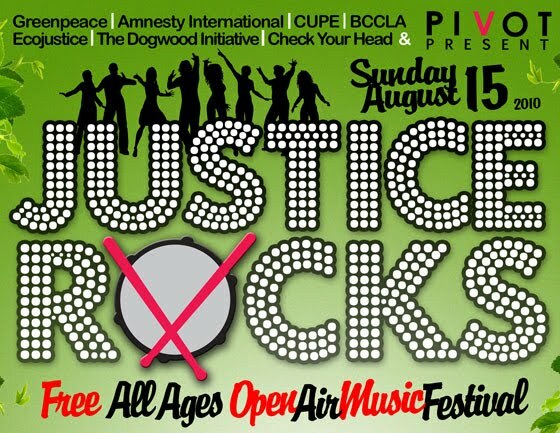 Join the fun on Sunday August 15th for the third annual Justice Rocks from 1pm until 8:30pm. This event features lots of great local bands and DJ's while highlighting some of the great work being done in our city by a variety of non-profit public interest groups advocating positive social change; you will meet people from Pivot, Greenpeace, Amnesty Intl, EcoJustice, BCCLA, CUPE, Oxfam, Living Oceans, and many more. Click here for the Vision of the many creators that make this happen.